Should you wait for later tax free bond issues or invest in the REC issue? REC is the first company to come out with tax free bonds this year, and I have written about them earlier last week. In that review I said that there is not much difference in bonds from different companies and it doesn’t really matter which company you buy the bonds from. However, Shiv pointed me to aÂ review of REC bonds by Business Line in which they recommend that you buy these bonds instead of waiting, and their rationale makes sense to me. The interest rates on these bonds are capped at the maximum G-Sec rate of comparable maturity and BL states that if interest rates were to go down in the near future, something which the RBI could do because of growth slowdown, then the later issues that hit the market will be at a lower rate than the REC issue. This is akin to what happened this year when the rates are lower when compared to the issues that came out last year. I think that the chances of a rate hike are very unlikely so if you are just procrastinating and don’t have a good reason to wait then go ahead and buy the REC tax free bonds. Now let me emphasize here that I’m not saying that these bonds are the greatest investment on the planet and everyone should go out and buy them today, there are certainly other options depending on your situation and Ashok has given a good example of one in his situation. I’m simply stating if you want to buy tax free bonds from the primary market this year, Â then it is a good idea to do so now instead of waiting for other issues which might have a better rate. No one knows the future, but the odds of interest rates going lower is a lot greater than interest rates going down. Author ManshuPosted on December 4, 2012 December 10, 2012 Categories Credit4 Comments on Should you wait for later tax free bond issues or invest in the REC issue? REC is the first company to start offering tax free bonds in this financial year (2012 – 13) and their issue opens on December 3rd 2012 and ends on December 10 2012. REC has been allowed to raise Rs. 5,000 crore through tax free bonds this year out which they have already raised Rs. 500 crores via private placement and this issue is for Rs. 1,000 crores. So this means that there likely will be another tranche before the financial year ends. However, last year’s experience shows that there is very little variation in the interest rates of even two issuers, let alone two issues from the same company. The interest rate on tax free bonds is also capped to the average G-Sec yield of the same maturity so there’s not much much you can expect in terms of a better rate. There are two series of bonds, one with a 10 year maturity and another with a 15 year maturity and then there are 4 categories of investors that can invest in them. Retail investors get a slightly higher interest rate, and they are under category IV. Here is a table that shows the details of this issue. REC is going to issue the bonds in both physical and dematerialized so you can buy them offline if you are inclined to do so. This also means that a Demat account is not necessary to buy these bonds. Which sections are these bonds tax free under? Somebody wanted to know thisÂ last year, and I imagine that’s more for preparing for an exam of some sort rather than any real practical use, but anyway, the bonds are exempt under Section 10 (15)(iv)(h) of the Income Tax Act 1961. Bonds will be listed within 15 days of closing of issue on both NSE and BSE, and there is no lock in on them so you can trade them in the secondary market immediately after listing. These are secured bonds which means that if REC goes insolvent, these bondholders will be paid before unsecured creditors. This doesn’t however guarantee full payment, and is no other form of guarantee either. In the past I’ve seen some people confusing a secured issue to mean something equal to a government guarantee that come what may, I will pay you money, and that’s not the case. Who are Category IV Retail Investors? There are four categories of investors for these bonds and the last category of investors which is the retain category get a slightly higher interest rate(half a percent). A retail investor is someone who invests less than Rs. 10 lakhs in these bonds. This bond issue has got very high rating, and that’s not surprising given REC’s financial standing. They have been ratedÂ CRISIL AAA/Stable by CRISIL, CARE AAA by CARE, IND AAA by IRRPL and ICRA AAA by ICRA. These are the best credit ratings that these companies assign and denotes excellent credit standing per the credit rating companies. When will interest be paid? This information will be useful next year when people are looking for interest payments, and the interest on the REC tax free bonds will be paid once a year on December 1st. Is there a step down feature? A step down feature means that the rate of interest that you get if you buy the bonds from the stock exchange is lower than what you would get if you were the primary allottee when the company issued the bonds. It exists with this issue so you will get a lower rate compared with what you get if you subscribe to the issue now directly with the company. The lower rate is half a percent lower, which is basically the premium retail investors are getting. How does this issue compare with listed bonds? In terms of pricing, the quick check I did on the prices indicate that these bonds are better especially if you include the transaction cost, but I do need to dig deeper in this aspect and I’m sure a good discussion will ensue in the comments section so I will either update the post with that information or do a second new one. What listing gains can I expect if I flip these bonds upon issue? Where can I get the REC bond application form? I think tax free bonds are a good thing to have for most people in the 20% or 30% tax bracket, which ones doesn’t matter that much. They are all quite similar as far as ratings goes and interest rate goes. I would say that it is always better to buy them from two or three different issuers so in case something does go wrong, all your money is not invested with just one company. This post is written by the CIBIL Consumer Relations team. I’ve been in touch with CIBIL to help put together a comprehensive FAQ and they’ve been gracious enough to send an extremely detailed post on the usual questions that people have about CIBIL and will also be answering any questions that you may have. Please go through the FAQ written by the CIBIL team themselves, and post any questions that you may have. 1.Â Â Â Â Â What are the different factors that affect your credit score? Credit Utilization: How much credit are you using? Are there are too many high balances, outstanding etc? Defaulting: How many accounts are past due â€“ how much and by how many days? What is the account status? Is it written off or closed or settled etc? Number of enquiries: Every time you look for additional credit through multiple lenders, an enquiry is made by those lenders to access your credit score. So it is not the most prudent practice to just shop around (i.e. fill up multiple loan application forms) to enquire about loan rates & eligibility from multiple lenders. As all this is reflected in your CIBIL report and gives an indication that you are â€œcredit hungryâ€. Type of credit availed: How old is the loan account or credit card account? Â What type of credit do you have?Â Is it secured or unsecured? Do you have a good mix or balance of credit or is it all credit cards /personal loans? 2.Â Â Â Â Â Which factor has the maximum weightage on your credit score? The CIBIL TransUnion Score is derived after keeping multiple factors in mind. The payment pattern (across loan categories) plays a crucial role in determining the credit score. But this should not be looked in isolation when you are trying to improve your Credit score. Do keep the factors listed above in mind to ensure your overall credit health improves and thereby improving your chances of getting a loan/credit card. 3.Â Â Â Â Â What is the difference between the CIR that you can buy for Rs. 154/- and the CIBIL TransUnion score for which you pay Rs. 470/-? A CIR or the Credit Information Report contains all your credit details from across Banks and financial institutions. This is a summary of your credit history and based on this, the CIBIL TransUnion Score is derived. But by paying Rs 470/- you not only get the CIR but the CIBIL TransUnion Score as well. Just to give an analogy, a CIR is like a report card but a CIBIL TransUnion score is like the overall marks/grade that you get. It distills all the information in a CIR and returns a score value which quantifies your credit and financial health. So by just looking at your Credit Score you can get a quick and better sense of your financial standing. It not only gives you an overview as to how you compare vis-Ã -vis other prospective borrowers but also helps you better understand your chances of loan approval because the credit score is the first credit screening tool used by a lender. f your credit score is high, they then start the process of evaluating your loan application. It is important to know that 80% of the loans approved are for individuals with a credit score of above 750. With just a CIR you will not be able to effectively gauge your chances of loan approval in the manner the CIBIL TransUnion Score (and CIR) can. 4.Â Â Â Â Â What does DPD stand for? What does it mean when DPD is 000 and what does it mean when it has a number next to it? On occasion you may also notice â€œXXXâ€ reported for your DPD on a certain account which implies that information for these months has not been reported to CIBIL by the Banks. If there is a number in the DPD column, then it means that the payment is late by that many days. So for example if it is 050, then it means the payment is late by 50 days. If it is 000 then it means the payment is as per the due date, so there is no deviation or late payment. 5.Â Â Â Â Â How long does it take for records in CIBIL to get updated after I clear a credit card thatâ€™s gone for settlement? First of all, it is commendable that you have taken the first step towards improving your credit health by clearing the dues. Once the payment has been made, the same will reflect in our records once the concerned credit institution updates us with this information. This is normally done on a monthly basis and you start building a positive credit history. Once the CIBIL records are updated, you will notice your CIBIL TransUnion Score will gradually start improving over time (provided everything else is on track as well). But do not expect the change to happen overnight. Just ensure you continue to monitor your credit health and be diligent about your credit payments and you will notice a positive change in the months to come. 6.Â Â Â Â Â It seems that a credit card going into settlement is a major negative factor, what can I do to improve my credit score if Iâ€™m already in this situation? Keep your total debt under control. If your total borrowings are significantly high, use some of your savings to repay some of your debt where possible. When you are seeking a new loan or credit card, do it in a relatively short amount of time. You donâ€™t want to have your report show that you are constantly looking for credit! 7.Â Â Â Â Â On my credit report, I see that some credit cards are listed as â€œsettledâ€ whereas some others are listed as â€œwritten offâ€, what is the difference between the two? Settled means where you would have made part-payment (in consent with the lender) against the total outstanding. Once this part-payment has been done that means there is no outstanding against your name by that lender. You will notice your amount over due and current balance would have changed to zero. When you are not able to make payments against the outstanding loan/credit card amount for more than 180 days, the lender is required to â€œwrite-offâ€ the amount in question. The lender then proceeds to report this on your CIR. Some lenders (as per their credit policy) when enquiring an individualâ€™s CIBIL report may not grant loan/credit card to those individuals whose accounts have been settled or written-off. It is always advisable where possible to have a clean account status. 8.Â Â Â Â Â If I have a credit card and I donâ€™t use it at all, does that affect my credit score in any way at all? It depends on the other credit accounts you have. If you already have many credit cards and loans then it is advisable to close it. But if you just have a one or two credit cards, then there is no negative impact on the credit score. On the contrary there can be a positive impact, as it shows under-utilization of credit (as long as your credit limit is not used). But ensure you continue to monitor the credit card despite the fact that you are not using your card. As many a times, credit cards come with an annual fees etc which may miss your attention as you are not tracking or using that card. This may result in non-payment which can then have a negative impact on your credit score. It is advisable to be vigilant and monitor your credit report on a regular basis. 9.Â Â Â Â Â I have a score of more than 750, and Iâ€™m still not getting approved for a credit card, what can I do? Check if Account status for any account is written off or settled- If there is then (where possible) pay off the debt and regularize the account. Check for outstandings or payment irregularities- Check if you have missed any of the payment and the outstanding balance has increased. We recommend you to pay the balance at the earliest. Check if there is high utilization of existing credit cards i.e., if there is maximum utilization of the credit card limit set against the cards. If this is the case then you can start by paying off your balances as and when you can to keep the overall utilization less. Â Also moderate the use of credit to the extent possible. Check if you are over-leveraged when compared to your income- Typically your total borrowing capacity is 50% of your net monthly income. If the current EMI is already 50% or more, then first pay-off your existing debt before applying for new credit. Check with the lender for the reason your credit card is not approved and then look for areas of improvement/correction. 10.Â Â How much time does it take to get rid of the effect of one default? I defaulted and cleared off my credit card in 2011 but my score is still low. If you have cleared off your dues donâ€™t forget to check your CIBIL report again to ensure the credit card issuer has updated the revised status of your account with us. Go through your CIBIL report in detail to ensure everything mentioned is accurate and your other payments are being made as per schedule. It is also advisable to avoid any new credit till your credit score has improved. Once everything is in order, you will notice that your CIBIL TransUnion score will gradually start improving. Offlate I have been listening many â€œDebt Recastâ€ by banks to some of the institutions like Kingfisher, may be Suzlon. Could you please post a detailed article on this debt recast ? Will this affect banks ? Debt Recast means that your lenders alter the terms of your loan easing your interest and / or principal burden, and this is usually done when a company is facing adverse circumstances. Lenders believe that easing the loan conditions will help the company get back on its feet and will be beneficial for them in the long run. If you look at how the Kingfisher Airlines story has evolved in the past few years, Kingfisher lenders had recast their debt once in November 2010 and the details from that debt recast are good examples of what easing interest or principal burden means. (1) Conversion of debt of upto Rs. 1355 crores from lenders into share capital. (2) Conversion of debt of upto Rs. 648 crores from promoters into share capital. (3) Reschedulement of repayment of the balance debt to lenders over 9 years with a moratorium of 2 years. (4) Reduction in interest rates. (5) Sanction of additional fund and non-fund based facilities by the lenders. The first of these points is fairly easy to understand which means that the lenders converted their debt into shares and this resulted in forgoing their guaranteed interest payments and instead their loans are now converted into shares which don’t have a guaranteed payout and are more volatile in nature. Kingfisher Airlines benefited because they are relieved of interest payment on this part of the debt and this eases their cash outflow. The second point is interesting because it doesn’t directly affect the lenders, but the lenders negotiate with promoters of the airlines and say that since we are forgoing our loans, you should match that too. In this case, the debt from the owners was converted into shares and they gave up their right to regular interest payment as well. The third point means that the debt is spread out over a longer repayment period and moratorium means that there will be a delay in payment of the debt. Reduction in interest rates doesn’t need any further explanation. The last point of sanctioning additional funds means that the lenders have agreed to give them more money with the hope that it will help them recover some of their old dues. They may have done this because the company needed to pay salaries or oil bills and had immediate need for cash. As you can probably see, this is a bad situation for both the lenders and the promoters. Both have to forgo their interest payments, and even the principal on their debt will have to be written down. So to answer Karthik’s original question – yes, this does affect banks and usually adversely (unless they get great terms which is unlikely) and I’d imagine that no bank ever wants to get into a situation where they want to do a debt recast. However, in the long run this can turn out to be a good thing if the company turns around and the shares are worth a lot more than the debt. The primary reason to do a debt recast is because the banks and lenders believe that easing up the loan terms will benefit the company and it will be able to get back on its feet and this will result in more money for the banks than a bankruptcy situation. It seems that 2 years ago, banks believed that Kingfisher Airlines still had a chance, and did a debt recast, but that thinking has changed now, and it looks like they don’t believe the airline will survive at all. There have been news reports that banks have an exposure of Rs. 7,000 crores on Kingfisher Airlines and the collateral barely covers this loan, and that shows you why banks did a recast two years ago. They knew that in case of a bankruptcy, they can only get what the collateral was worth and it’s clear now that the collateral wasn’t enough to cover much of the loan. It was better at the time to pump in some more cash, ease terms and hope that things turn around. The past two years have shown that the situation hasn’t improved, and it looks like now the banks feel that it’s better to write off these loans instead of pumping in more funds and throwing good money after bad. To summarize, banks do a debt recast when they think that the company still has a chance at survival and can be more profitable to the banks if it survives even though that means some losses in the short run. This does affect banks negatively and I imagine neither a bank nor a company ever wishes to be in this situation. What would you do if you come to know that a bank has sanctioned a loan in your name when you have not actually applied for any? How would you react when you find out that someone has used your name to get a credit card and has run up in couple of lakhs of rupees in charges using it? Or worse, what if any of your credit card is used for some criminal activity? You would most likely stand clueless and approach the bank in a panic to ask for all the details about it. Most commonly this is a result of something called â€œIdentity Theftâ€ or just â€œId Theftâ€. Now, what is this Identity Theft? Identity theft occurs when someone uses your personal identification information to apply for a loan or a credit card. If this loan is sanctioned or credit card is issued, the individual has access to those credit facilities against which you would be held liable, if not paid for. Hence, the lender will update this default in your Credit Information Report (CIR) which will severely affect your CIBIL score. Many a times we are required to provide our self-attested personal identification information in the form of PAN card, passport, driving license, voters id card or other similar documents, say for getting a bank account opened or making some kind of investment. Do we mention the purpose on the Xerox copies of these documents while we hand-over them to the concerned individual? Most of us do not. This careless act of ours leaves a big scope for these fraudsters to misuse our documents in such a way which might make us regret for the rest of our lives. If you have read the previous CIBIL articles posted here, then you must be aware by now that how important role your clean CIR or CIBIL score plays in the loan application process. It helps you enjoy the benefits of easier and faster processing of loans or credit cards at better rates and/or terms. 1. Never share your credit card numbers and other personal identification information, especially over the phone or while browsing the internet. 2. Many companies ask for more information than they really need. Try filling the application forms yourself and provide only that information which is marked mandatory or which is required for your own convenience. 3. Carry only as many credit cards in your wallet as are absolutely necessary. Keep photocopies of all your cards handy with you so that they can be blocked quite easily in the event your wallet gets stolen. 4. Always deal with only those entities and websites which have been authenticated by service providers like Symantec etc. You can check the websiteâ€™s legitimacy by clicking on their logo and thereby eliminate the risk of dealing with a clone of the legitimate company designed to collect your personal and financial information. 6. Review your CIR and monitor your CIBIL score at least once or twice every year to make sure your credit history accurately reflects your credit usage and activity and no unaccounted credit facility gets extended in your name and no new enquiry gets initiated by any of the banks. If you notice any discrepancy in the report, get in contact with the lender as well as the credit bureau immediately. 7. Make sure nobody, other than you or your close family members, has access to your personal information, identity proofs and address proofs. Keep all of these documents in a secure environment. Problems can strike anyone at any time and leave a long-term impact. Awareness about some of these problems and taking necessary steps to build a shield against them can minimise their impact. So, I hope, now we all know what we need to do in order to safeguard our identities from getting stolen. Many of you must have checked your CIBIL credit score sometime in the past and for some of you it must have got a surprise either positively or negatively. Some of you might have been caught unaware of a credit card account running in your name with annual charges being levied year after year. Some of you might have undergone for a loan settlement with the lender which could have impacted your score quite negatively. But to your surprise, some of you could have found your credit score to be quite high, despite defaulting a couple of times. This is due to some unique but scientific methodologies being adopted by CIBIL to calculate your score. 1. Late payments or defaults in the past: Your payment history has a significant impact on your credit score. So, if you have missed payments on any of the existing loans over the past couple of years, then the credit score would get negatively affected as it indicates you are facing difficulties in servicing the existing obligations. 2. High utilization of credit limits: You must remain quite careful while using the credit limits available on your credit cards. A higher and higher utilization pattern against the available credit limits is an indication of an increased repayment burden and may negatively affect your credit score. Lower outstanding balances getting reflected in your credit card statements improve this score. 3. Higher percentage of Credit Cards or Personal Loans (i.e. Unsecured Loans): A higher number of unsecured loans coupled with a high utilization would also affect the score in a negative way because of the fact that these unsecured loans carry a very high rate of interest as compared to secured loans like home loans or car loans and result in larger payments and higher defaults. 4. Behaving Credit Hungry: If you are behaving â€œCredit Hungryâ€ (i.e. in an urgent need of money) and have applied for new credit facilities with a large number of lenders, then it is going to affect your score negatively and make the lenders more cautious while evaluating your application for a fresh loan. Can your CIBIL Credit Score be improved? If yes, how? As I mentioned in my earlier post, it is like a CAT examination. Like you can always improve your CAT score by appearing for the exam again, your CIBIL credit score can also be improved, but not overnight. If you have taken a 20-year home loan which is just a couple of years old and youâ€™ve defaulted on your EMIs 3-4 times since the beginning, then it will probably take you at least 2-3 years or probably more than that with regular EMI payments to improve your score. You will have to maintain the greatest of financial discipline in order to secure a better credit treatment in the future. Here is how it can be done. 1. Pay your loan EMIs regularly in a timely manner to maintain a clean credit history: Try to keep a diligent track of your EMIs in case you are running more than one loan. 2. It is highly advisable to make full payments on your credit card instead of just the minimum payment. In case it becomes very difficult to pay the bill in full, at least make the minimum payment without fail. It takes you a longer time to build your credit history with a loan as compared to a credit card as these loans are usually for a longer tenure whereas a regular payment of your credit card bills can help you start building a good credit score as you keep on making the regular payments. A credit card debt is categorized as a revolving credit and it helps in building a good credit score faster if the payments are regular. 3. Do not apply for an extra credit card unnecessarily when your bankâ€™s relationship manager approaches you to get one and actually you do not require it. Applying for an extra card or a loan without any requirement would mean more credit exposure and reaching near the cardâ€™s credit limit would result in a lower credit score. 4. If you have been issued a credit card but you have not used it very frequently or the utilize credit limit has been very low, then this would affect your credit score in a positive way as unused credit cards actually imply that you are financially secure. 5. You should use special incomes like bonus or a monetary gift or some other source of savings for the prepayment of some of your existing debt. Early repayment of debt also helps in improving your score. 6. Avoid becoming a joint account holder or a guarantor in a loan or a credit card facility as any default would lower the quality of your credit score. 7. Avoid going in for a settlement or â€œwrite-offâ€ of your loan accounts as it implies that you have not been able to pay the past dues. Keeping the credit history clean improves your credit score. 8. You should keep reviewing your credit history on a regular basis to ensure that the credit report accurately reflects your current financial status. At the end of the day, common sense should dictate what you do with your financial life and good financial habits along with awareness of credit scores will help you build a good credit history and a good credit score. By now, you must have become well versed with the contents of a Credit Information Report and the significance of a credit score. Now it is time to know how you can access your report and know what your credit score is. You can access your CIBIL TransUnion Score along with the full Credit Information Report for a nominal fee of Rs. 470. You are just required to fill a request form with some basic details like Name, Address, Date of Birth, Gender, Contact Details etc. and keep the self-attested copies of your Identity Proof and Address Proof ready. Online payments can be made either through Net Banking platform of a bank or through a debit card/credit card/cash card. The net banking facility is available with 33 banks as of now. You will get a unique CIBIL registration ID and transaction ID as a confirmation on successful completion of your online payment. After the payment is made, you need to answer 3-5 questions about any of your loans or credit cards to authenticate your application. Youâ€™ll then be required to provide the soft copies of your identity proof and address proof. If your application gets authenticated, youâ€™ll receive your credit score and CIR in your e-mail in about 2-4 days. However, if the authentication fails, you need to take a printout of the receipt for online payment and mail it to the below mentioned CIBIL address along with your proofs. Nariman Point, Mumbai 400 021, India. If you decide against going online, then you will have to take a printout of the application form, duly fill it and get a Demand Draft (DD) made worth Rs. 470. Again attach the copies of your identity and address proofs along and send it to the above mentioned address. Also, if you wish to purchase only your Credit Information Report, then you can do so by having a DD of just Rs. 154 and follow the above mentioned process. But, in that case, the process would be offline only because there is no provision to get it online without asking for your credit score. You also need to sign the form in order to confirm your requests. Note that the address proof (except passport) – bank statement, telephone bill, electricity bill or credit card statement should not be more than 3 months old and should be in your name matching with your name in your loan/credit card account or on your PAN card (if you do not have any loan or credit card). Like many of us undergo physical health check-ups, I think one should get his or her credit score checked at least once a year. It will keep you aware of your credit health and make you take necessary steps to correct it whenever required. So what are you waiting for now? Just visit the CIBIL website and get your score checked. Iâ€™m sure there will be many surprises in store for many of us. Just share your score and experiences here with us so that we have a platform to understand these things in more detail. You know how increasingly critical your credit score is becoming these days. Nowadays, even oneâ€™s employment prospects could be affected by this score as the employers have started asking prospective candidates to submit their credit information report (CIR) during the interview process and a few candidates get rejected due to their poor credit history. A few days back a friend of mine told me about this case in which a senior level MBA was refused employment in a bank because of his poor credit history. The employer came to know about a credit card payment default by this guy while carrying out his background check. I think time is not very far away when one would be required to upload these reports on matrimonial sites to find a suitable match 🙂 or even during school admissions of their children. What is a CIBIL Credit Information Report (CIR) and what is its significance? A CIBIL Credit Information Report (CIR) is a record of oneâ€™s credit payment history compiled from information provided by the lenders such as banks and financial institutions. It provides details about oneâ€™s basic information, details about all the credit facilities availed, past payment history, amount overdue, current status, inquiries made etc. Payment History –Â This section of the report shows your history of payments for a period of 36 months against the loan(s) taken or credit card dues. Days Past Due or DPD tells a lender by how many days the payment was late after the â€œdue date of paymentâ€. Current Outstanding BalancesÂ – This section of the report shows the current outstanding balances on all the loans taken by you and accordingly helps the lender to determine your strength to take on additional EMIs in relation to your current income. Naturally, lower the current outstanding balances, the better the chance of your loan getting approved. New Credit FacilitiesÂ – This section of the report shows all the credit facilities that have been sanctioned to you in the recent past, as a result of which the proportion of the monthly outflow against your monthly income must have increased and it is a negative factor from the lenderâ€™s point of view. New InquiriesÂ – This section of the report shows all of the inquiries that have been made in the recent past by the lenders regarding your loan applications. So, a higher no. of inquiries indicates an urgent need of money on your part and hence a lower credit score. Here is a Sample Credit Information Report and we try to make you understand what is there inside this report. Sanctioned Amount:Â This is the loan amount disbursed by a lender to a borrower. Current Balance:Â This is the outstanding amount a borrower still owes on a particular credit facility. Lenders typically take 30-45 days after the payment is received to update it with CIBIL. EMI Amount:Â Equated Monthly Installment that a borrower pays on the sanctioned loan. Actual Payment Amount:Â This is the amount a borrower has actually paid against the due amount or EMI. If it is a loan, this amount may be more or less than the EMI Amount. Amount Overdue:Â This is the amount that has not been paid against the due amount. Repayment Tenure:Â It is the term of the loan. Collateral:Â An asset like property, shares, gold etc. which has been provided to a lender as a security to protect the lender in the event of a loan default. Credit Limit:Â Amount of credit available in case of credit card or overdraft facility. Cash Limit:Â Amount of cash one can withdraw with the credit card. High Credit:Â Highest amount ever billed against a credit card or overdraft facility. Days Past Due (or DPD):Â DPD suggests the no. of days a due payment was late after the â€œdue date of paymentâ€. If it is â€œXXXâ€, then DPD was not reported by the lender. Asset Classification (or AC):Â These are types of DPD based on RBIâ€™s Asset Classification Â Â Â Â norms. STD – StandardÂ – Payments made within 90 days after the due date. After 90 days, it is termed as a Non-Performing Asset (NPA). SMA – Special Mention Account –Â Special account created for reporting Standard account, moving towards Sub-Standard. SUB – Sub-Standard –Â An account which has remained an NPA for up to 12 months. DBT – Doubtful –Â An account which has remained an NPA for a period of 12 months. LSS – Loss –Â An account where loss has been identified and remains uncollectible. Enquiry:Â Enquiries are added to oneâ€™s report everytime a lender decides to access the borrowerâ€™s CIR. Control Number (or CN):Â This is a unique number of every Credit Information Report (CIR). SingleÂ – A single borrower is solely responsible for making payments against the credit. JointÂ – More than a single borrower jointly responsible for making payments against the credit. This will also reflect on the other individual(s) CIR. GuarantorÂ – A guarantor pledges to repay a loan on behalf of a third party who has taken the loan. Authorised User – This is used for â€˜add-onâ€™ credit cards. An authorised user can use the add-on credit card but he is not responsible for paying the dues. Written-Off and Settled Status:Â If the lender has either restructured a loan or has written it off or has settled it at some amount less than what the lender believes it was owed, then this section would be seen as populated in the report. Written-Off Amount (Total):Â This field reflects the total loan amount written-off by the lender. Written-Off Amount (Principal):Â This field reflects the principal amount written-off by the lender. Settlement Amount:Â This is the amount that the borrower has agreed to pay and the lender has agreed to settle the claim against the amount due. The rest of the amount is written-off by the lender. Suit filed/Wilful Default:Â In case the lender has filed a suit against a borrower, the lender has to report it as per the RBI guidelines as one of the following: 1) No Suit Filed 2) Suit Filed 3) Wilful Default 4) Suit Filed (Wilful Default). CIR provide lenders the ability to differentiate between those who have honored their obligations responsibly and those who have defaulted. Individuals who appropriately manage their obligations build a reputational collateral with the lenders. In turn, this reputational collateral allows them to negotiate better terms with a lender. Hence, whenever you decide to start your loan hunt, it is advisable to purchase and review your CIR. It helps you understand what the lender will review while evaluating your application. So, you have time to identify the discrepancies that you may find on your CIR and get them rectified on time in order to prevent any problems during the loan evaluation process. If you have taken a home loan and have been paying your EMIs quite regularly without even a single default, then it is highly likely that the next time you require any car loan or a credit card, you may be able to secure any of them with quite an ease, that too at a lower rate of interest and probably get your bank to waive the processing charges also. Why is it so and how is it possible? Iâ€™ll try to share all of that with a series of posts about it. What is a Credit Information Bureau and how it functions? A Credit Information Bureau (CIB) is a repository of credit information of all the customers of bureauâ€™s members, which includes banks, financial institutions, non-banking financial companies, housing finance companies and credit card companies. Members share this credit information of their customers with CIBs on a monthly basis so that their database gets regularly updated. CIBs collate only credit information i.e. information on loans such as home loans, automobile loans and personal loans and information on credit facilities such as overdraft facility and credit cards. They do not have any details of customers’ savings accounts, fixed deposit accounts or other such investments which constitute the liability portfolios of banks or financial institutions. At the same time, CIBs disseminate the information to these same lenders, as per their requirements, helping their credit underwriters to make effective credit or lending decisions. These lenders use this information to generate Credit Information Reports (CIRs) and Credit Scores. CIBs are also also known as Credit Information Companies (CICs). In India, RBI regulates these bureaus. In 1999, RBI proposed setting up such kind of CIBs and start operating. First of such CIBs – CIBIL was set up in 2000. In November 2008, RBI allowed FDI of up to 49% in credit information bureaus, with a ceiling of 10% of the total voting rights for any single investor group. What is CIBIL and which other CIBs are there in India? Credit Information Bureau of (India) Limited, or popularly known as CIBIL, became the first such organization that started collating credit information contributed by its members and maintaining records of an individualâ€˜s payments pertaining to loans and credit cards. 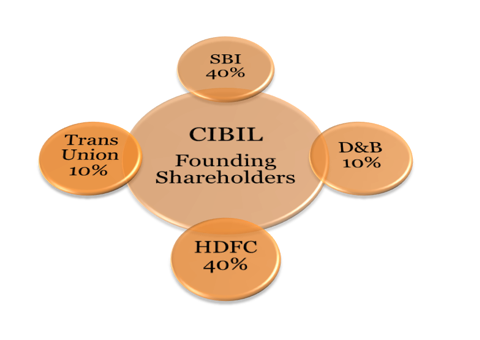 CIBIL was incorporated in 2000 with State Bank of India (SBI), Housing Development Finance Corporation (HDFC), TransUnion and Duns & Bradstreet (D&B) acting as its founding members and in a due course, the shareholdings got diversified to include many other banks and financial institutions. It started with a paid up capital of Rs. 25 Crores. Apart from CIBIL, there are three other credit information bureaus operating in India at present – Equifax, Experian and High Mark. 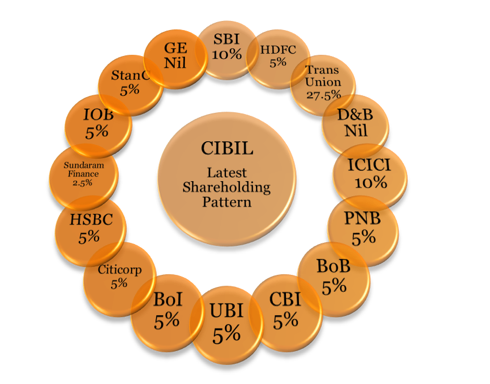 But a large chunk of market share is with CIBIL only as it started collating data quite early and this is the reason I have decided to focus on the working style of CIBIL and the parameters it uses for this purpose. What is a CIBIL TransUnion Score and what is its significance? CIBIL TransUnion Score is a score measured out of 900 which provides a lender with an indication of the â€probability of defaultâ€ by an individual based on their credit history. This score suggests lenders the pattern of an individualâ€™s credit usage and loan repayment behaviour. Your CIBIL TransUnion Score is like your marks in any competitive entrance exam, say like CAT entrance exam for MBA. A higher score in the exam (credit score) do increase your chances of getting admission into a good B-school (getting a loan approval) but doesn’t guarantee it unless you do good in your interview, group discussion and Ex tempore (your income, years of employment, debt burden, age etc). All these things should fit with a lenderâ€™s internal credit policy before oneâ€™s loan application gets the final approval. 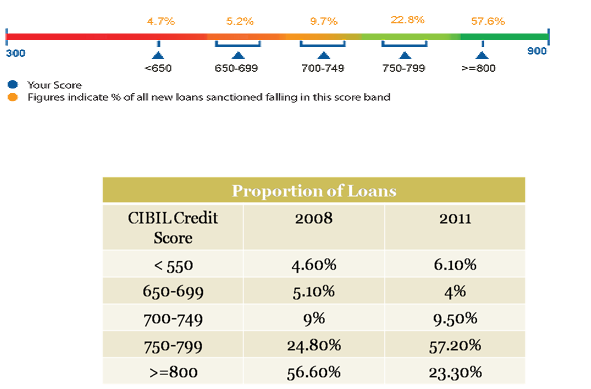 CIBIL TransUnion Score ranges from -1 (or NH) to 0 (or NA) and 300 to 900. Loan providers used to prefer a credit score which was greater than 700 and over the years their preference has gone past 750 now. The closer the borrowerâ€™s CIBIL TransUnion Score is to 900, the more confidence the lender will have in borrowerâ€™s ability to repay the loan and hence it becomes more likely that the loan application will get approved and the better would be the terms offered by the lenders. Without a Score, the lenders would treat all loan seekers equally, probably charge a higher rate of interest to all the borrowers. In other words, the entire class of students (borrowers) getting a punishment for the mischief played by a few (defaulters). Though I did not find anywhere what â€˜NHâ€™ or â€˜NAâ€™ stand for in CIBIL TransUnion Score terminology, I assume the full form of NH to be â€œNo Historyâ€ and NA to be â€œNot Applicableâ€. An applicant gets a score of NH or -1 when he does not have a credit track record at all and a score of NA or 0 when his credit track record is less than 6 months. 1) One does not have a credit history at all or enough of a credit history to be scored, i.e. the applicant is new to the credit system. 2) One does not have any credit activity in the last couple of years. 3) One has just add-on credit card(s) and no direct credit exposure in his/her own name. If a person has never used a credit card or taken a loan, then there will not be any relevant credit score for a lenderâ€™s reference. The eligibility for a loan, in that case, will be based on oneâ€™s income, years of employment, age, etc. That means, if you did not appear for the CAT entrance exam then the B-schools will judge your abilities and give you the admission on the basis of your marks in 10th, 12th or college exams and other factors such as interview, group discussion, Ex tempore etc. This was the first post on CIBIL Credit Score system and Credit Information Report. Iâ€™ll soon come back with some more details to throw some more light on this unique system of keeping record of an individualâ€™s credit history. Â How to check your Credit Score and purchase the Credit Information Report? Factors affecting your Credit Score and Can a Credit Score be improved? How to get the discrepancies corrected on my CIR? and some cases of customer disputes. The topic of home loans has appeared a few times in comments now, and in this post I’ll cover some things that I have learned about home loans over the years. When you approach a bank to give you a loan for a house, they have it assessed through their own appraisers and this is an important criteria in how much loan you can get against the property. While I’m not familiar with the methodology for this, there are some old apartments and houses whose assessed value is a lot lower than the actual market price so it is impossible to get a loan on them that could actually enable a buyer to buy the property. When you buy a house you need to pay stamp duty and other registration charges and this can be a big sum in its own right. These charges include stamp duty, VAT, service tax, and registration charges, and can go as high as 10% of the total cost you have to bear. It used to be that banks could include stamp duty and registration charges in the property value and then disburse the loan based on that but RBI stopped that practice earlier this year in order to discourage down speculation in real estate. If the house you plan to buy is over Rs. 20 lakhs, then the bank can only give you a maximum of 80% of the value as home loan. This limit goes up to 90% if the house is assessed at less than Rs. 20 lakhs, but I don’t think there are many of those around these days. This is another measure mandated by the RBI to curb speculation in the real estate market. A fixed interest rate doesn’t change throughout the tenure of the loan, while a floating rate changes with market rates. In general, fixed rates are slightly higher than floating rates, but most of the loans disbursed today are floating rates and not fixed rates. Floating rates are different from teaser rates that used to be offered by banks till some time ago. Teaser rates referred to home loans that banks gave at an initial interest rate that was much lower than what they should have actually been charging. So, they would just charge you 8% in the first year, and then that would go to 9% in the second year, and then climb to 11% from the third year onwards that made a big difference on your EMI. This was something else that was stopped by RBI in order to stop banks from enticing people into taking loans that they couldn’t afford and get into a US style housing problem. Current home loan interest rates are hovering at about 10.75% and you should expect to pay about this much if you are in the market for a home loan today. In the beginning of your home loan payments – you are paying more of interest than the principal itself so in general it is a good idea to bring down the principal by prepayment as far as possible. What’s good for you as a borrower is not good for the bank as a lender and to discourage prepayment they used to levy a penalty on any such amounts. Now RBI has asked banks to stop charging prepayment penalties as well, and that’s a good thing for borrowers who can now prepay loan principal if they want to. Home loan repayment has two components – principal and interest, and both of these are treated differently for calculating tax benefits. The principal part is covered under Section 80C and the interest part is covered under Section 24L. These are the key things that came to my mind while thinking about home loans in India, and if you want to add or point out something then please do leave a comment!